March 26, 2009 | Bag lady Barbie, Pregnant Ken and R.N. Joe. Don't be surprised if you haven't seen commercials for the twisted versions of these iconic toys flashing across your television screen. 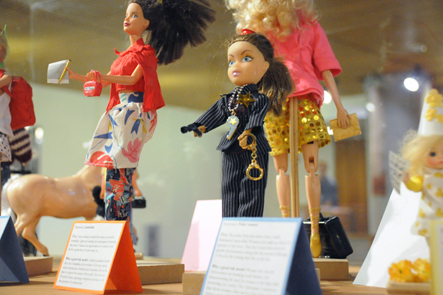 Instead, USU students can see these dolls, along with 161 others showcased in the basement of the Merrill-Cazier Library, as part of the Reinventing Barbie Bash sponsored by the women and gender studies department. In order to celebrate National Women's History month, USU students and Cache Valley residents redesigned Barbie and Co. to make a statement. "We wanted to take these iconic dolls and do something a lot more fun," said Brenda Cooper, USU professor and organizer of the event, and an award ceremony Tuesday. "Our goal was to take them and change the statement." Storee Powell, junior majoring in print journalism, took home second place for her re-creation of several Barbies entitled "Good vs. Bad Role Models" and said her biggest motivation for entering the contest was to spread a message about positive role models for young girls. "I get irritated at how the press will cover gossip and celebrities who are not reflective of what society is," Powell said. "Often times celebs are not good role models. For example, all the little girls want to be Hannah Montana and it gives them the wrong idea. They should be striving to be something attainable." Powell said she first became interested in gender issues when deciding what minor she should choose. After talking to Cooper, Powell said she decided her passion was women and gender studies. "I got really excited about it," Powell said. "There are a lot of issues facing women and I wanted to be a voice for that." As a print journalism major, Powell said she spends a lot of time evaluating what messages the media send. Powell said she feels motivated to change the way women are covered because of how often she sees stories dedicated to people who present a negative body image to young people. "People like parents and teachers who should be covered and praised are not receiving the press time they deserve because of much space and time is devoted to celebrities," Powell said. The Reinventing Barbie Bash was just one outlet Powell said she uses to spread a positive message to other women. "I like the idea of reinventing a Barbie doll because she depicts and unattainable body similar to celebrities who have plastic surgery," Powell said. "It's just not realistic." Powell said she hopes that by reinventing Barbie for her 50th birthday she will get students thinking about their bodies in a realistic way and setting attainable goals. "I think we need to start thinking about reality vs. ideals," Powell said. "We need to re-evaluate our thinking because it's hurting us. We grew up with Barbies and I think when you look at these dolls you need to think 'Maybe this isn't right.'"